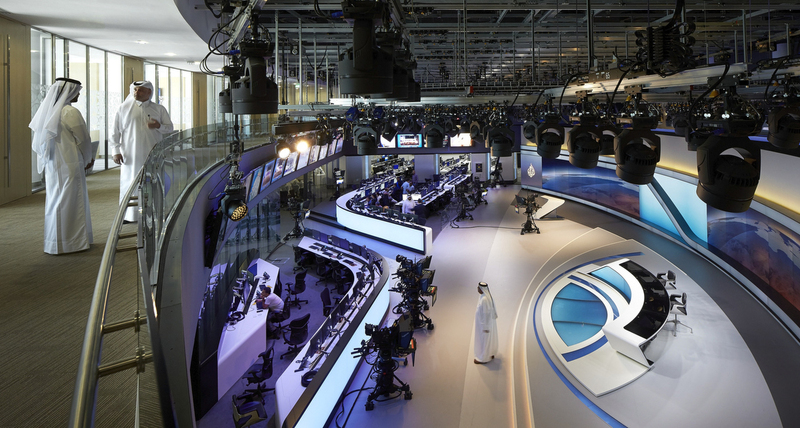 Al Jazeera capitalized on a facility expansion to reimagine and re-create its broadcasting studios from the ground up. 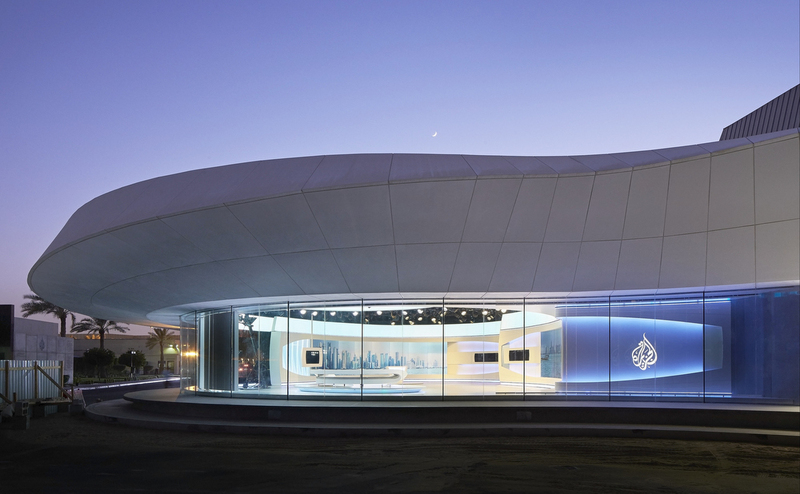 The various new venues feature an ultra clean and almost surreal design that combine massive video walls, glossy surfaces and architectural elements of the building itself to create a dynamic and functional newsgathering environment. “Our design focused on building space that helps staff carry out their functions efficiently while also accounting for future expansion,” said Ramzan Alnoimi, director of network creative at Al Jazeera Media Network, in an interview with NewscastStudio. Alnoimi has worked for AJMN’s for more than 17 years, overseeing multiple studio design and brand development efforts, including the master rebrand in 2013 and the Al Jazeera Arabic redesign in 2013. 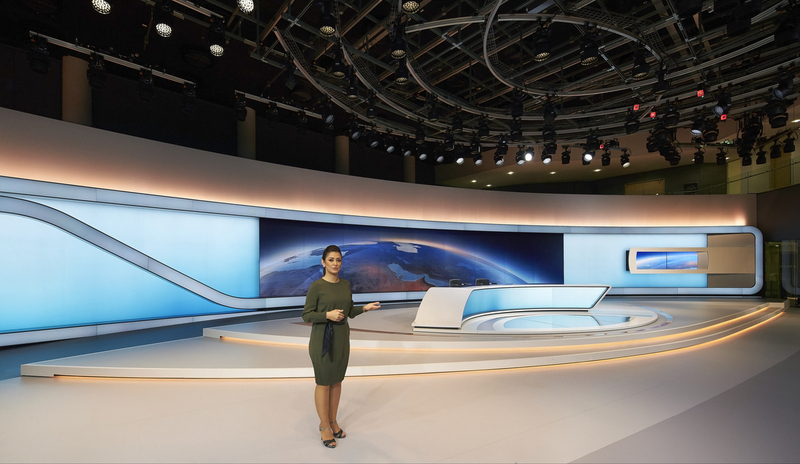 At the heart of the update is a new building on Al Jazeera Media Network’s campus that houses the new studios and workspace. 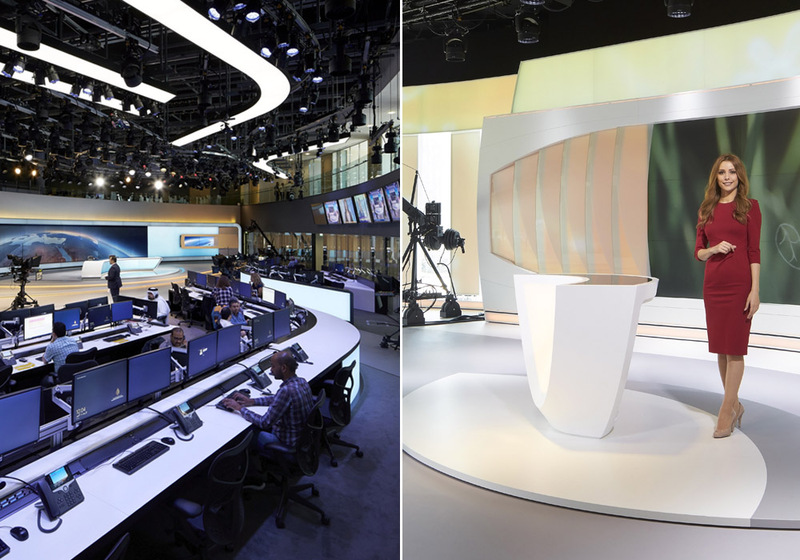 For Al Jazeera Arabic, the international news channel that launched from Doha in November 1996, the upgrades include an open-concept newsroom studio that encompasses about 1,500 square meters, with a main news area and a smaller studio for current affairs programming. Together, Studio 5 and the newsroom are designed to accommodate 250 journalists, producers, editors and staff. 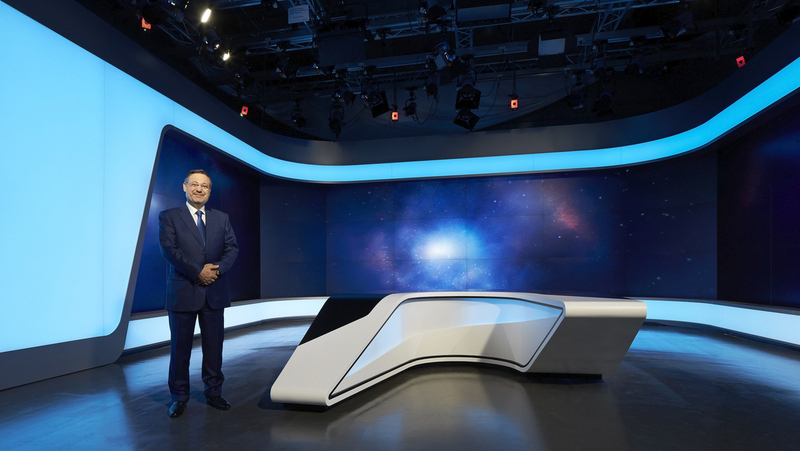 The main news studio for Al Jazeera Arabic includes a five-person, curved anchor desk and a secondary standing desk with an interactive touchscreen wall. 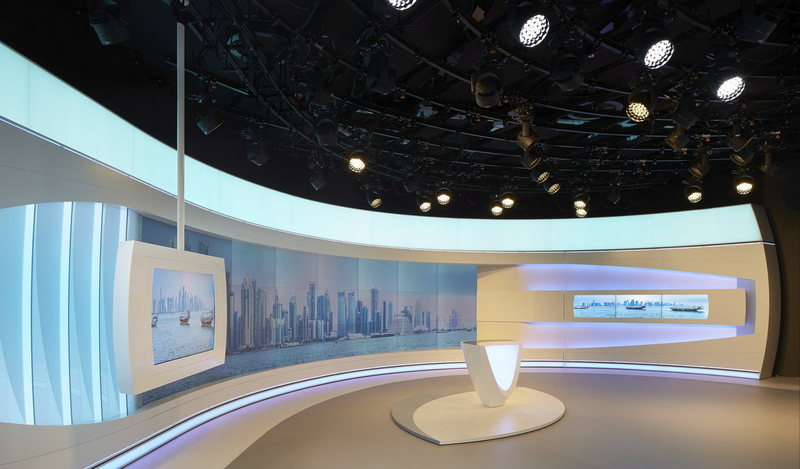 Gentle curves and backlit sections allow the studio to transform based on the time of day and the news program being shot, with video surfaces strategically placed around the set. The studio uses 16 Sony HDC cameras and more than 30 Motion Analysis tracking sensors/cameras to track three Sony HDC cameras for immersive, augmented reality graphics generated through Vizrt. “Our aim was to create a unique media space highlighting the content flow represented in an innovative 360-degree environment,” said Alnoimi. Studio 14 works in architectural detailing along with floor-to-ceiling curved windows to bring the outdoors into this lighter and brighter space, creating a less formal presentation area that includes a curved custom sofa, multiple video walls, a presentation pod and ceiling-mounted video panel. 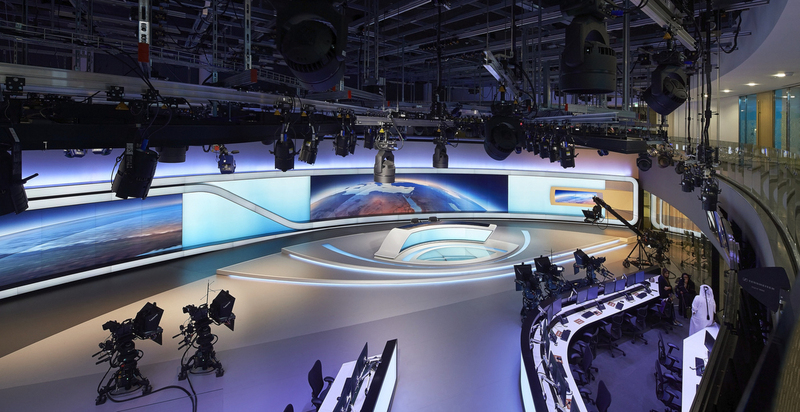 The floating header and trim of the studio space are designed to change color through the use of LED technology, making the set into a large video surface. 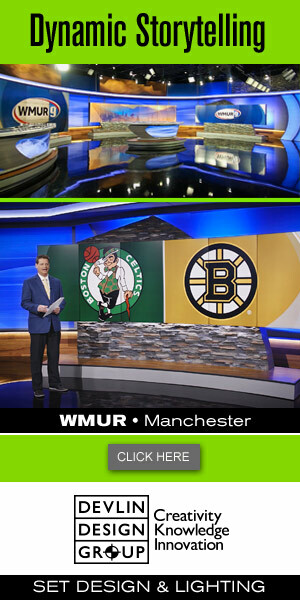 In addition to these primary spaces, the network also has the use of a smaller studio that is dedicated to immersive graphics, with a large video wall and motion-tracking camera system. Off camera, three control rooms support the new studios, equipped with the latest in broadcast technology.